Mill and overlay projects continue to be a cost-effective method of pavement management for agencies across the state, but for many of us that have the capability to complete overlays in-house, timely contractor pavement milling is a barrier to effectively managing these projects both from a public and public works perspective. Often with these projects, notices are sent out; public officials are notified; crews mobilize to replace curbs, lower gate valves and manholes, move mailboxes, and more; and then work in the project area stops for extended periods waiting for the contractor’s milling or the paving crew to arrive. Sometimes, at no fault of the contractor or the city, the project is delayed and staff is left to explain the lack of progress to city officials, managers, and residents. 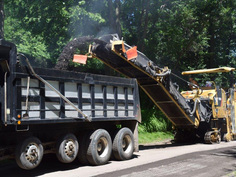 In 2012, City of Minnetonka Public Works Director Brian Wagstrom decided to solve this problem and with approval of the city council, purchased a bituminous pavement milling machine. The time was right as the city, which was largely developed between 1970 and 1990, began to see a critical need for pavement preservation and restoration. It was at this time the city began to embark on a multi-year pavement management plan consisting of overlaying or replacing more than 13 miles of roadway a year on average. Staff’s hope was that the plan would allow the overall pavement condition index to stabilize and improve for the more than 254 miles of roadway the city maintains. The mill is utilized in three key ways: public works led in-house overlays, engineering-led contract overlays, and neighboring community collaboration. Three construction seasons after purchase, staff was pleased that the city had already recovered the purchase price of the machine by the savings from performing milling that was formerly done by contractors. The most important benefit though was the resident satisfaction from having their roads milled and paved in a very compact time frame. The City of Minnetonka‘s in-house overlay program is managed by public works staff and focuses on extending the life of residential and local roadways. The in-house overlays involve removal and replacement of the top 1.5 inches of pavement, making drainage corrections, and rehabilitation of bituminous curbs on many streets. This level of maintenance is performed on pavements that are 15 to 20 years of age and have functioning, but aged bituminous surfaces and curb that require attention. To achieve this, public works staff successfully developed a process for handling these neighborhoods which have proven to save the city money between complete reconstructions. The mill has sensors to control grade based on the existing pavement surface adjacent to the curb. After milling, there is a neat edge next to the weathered curb which serves as the tie-in point for the new pavement. A custom gate welded to the paver’s screed extensions allows for an overlay of the bituminous curb providing additional life, crown for surface water control, and improved appearance. Larger scale mill and overlay projects are a collaborative effort involving public works and engineering staff. The focus of these projects is to extend the useful life of collector and reliever roadway pavements. These contract projects involve the removal and replacement of a minimum of 2 inches of pavement and replacement of bituminous curb. These projects are bid on an annual basis, but the city retains responsibility for milling operations. The city has found that projects of this size benefit from contracting traffic control, trucking, and sweeping operations. Engineering staff have established specifications and custom bid items to streamline city operations, while providing contractors clear direction on how many trucks for hauling must be provided to support milling operations, traffic control needs, and prepare the site for paving once milling has been completed. The mill also spends time helping with milling needs in neighboring communities. Minnetonka has always had a strong partnership with neighboring cities, and the mill has become an integral part of this collaboration to best serve their residents. Throughout the construction season partner cities including Plymouth, St. Louis Park, and Golden Valley work closely with Minnetonka staff to schedule milling of their local roads and, in return, provide trucking for paving projects performed by public works. Beyond the quantifiable financial benefits, staff points to the customer service advantages of owning a mill that make the biggest impact to the public, specifically operational control that allows the city to adjust operations as necessary to provide adequate access and minimal inconvenience to residents throughout the project. This milling capability makes certain that neighborhoods don’t go for weeks with a disturbed road surface in front of their residence and allows for quick repairs when pavement deficiencies are discovered.